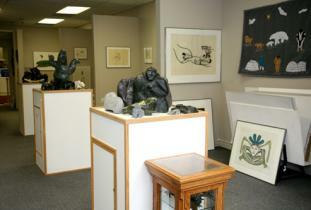 Our Gallery is named after Nunavut, the Canadian arctic territory established on April 1st, 1999. We carry Inuit sculpture from nearly all areas of Nunavut including Baker Lake, Cape Dorset, Arviat, Kimmirut (Lake Harbour), Pelly Bay and more. Nunavut Gallery also carries prints from Cape Dorset, Holman Island, Pangnirtung, Povungnituk, and Baker Lake, as well as drawings and wallhangings from Baker Lake. We carry many world-renowned artists such as: Kenojuak Ashevak, Sheojuk Etidlooie, Jessie Oonark, Luke Anguhadluq, Barnabus Arnasungaaq, Miriam Qiyuk, John Tiktak. We are one of the largest collections featuring over 450 artists and 4200 works of art showcased in our 2500 square foot gallery.